Your Suunto Ambit3 Sport provides two indicators for following your need to recover after training: recovery time and recovery status. Recovery time is an estimate in hours of how long your body needs to recuperate after training. The time is based on the duration and intensity of the training session, as well as your overall fatigue. Recovery time accumulates from all types of exercise. In other words, you accumulate recovery time on long, low intensity training session as well as at high intensity. The time is cumulative across training sessions, so if you train again before the time has expired, the newly accumulated time is added to the remainder from your previous training session. The number of hours you accumulated for a given training session is shown in the summary at the end of the session. The total number of hours of recovery time you have remaining is shown as a view of in the activity monitoring display (see Activity monitoring). Because recovery time is an estimation only, the accumulated hours are counted down steadily regardless of your fitness level or other individual factors. If you are very fit, you may recover faster than estimated. On the other hand, if you have the flu, for example, your recovery may be slower than estimated. To get an accurate indication of your actual recovery state, we recommend using one of the recover tests (see Recovery status). You can check your recovery status with the quick recovery test or sleep recovery test, powered by Firstbeat. 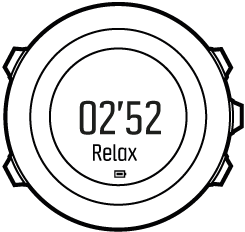 The tests require a Bluetooth-compatible heart rate sensor that measures heart rate variability (R-R interval), such as Suunto Smart Sensor. Your recovery status is indicated with 0-100% result scale as explained in the table below. Values below 50% measured on several consecutive days indicate an increased need to rest. Both the sleep test and quick test need to be calibrated in order to provide accurate results. The calibration tests define what 'fully recovered' means for your body. With each calibration test, your watch adjusts the results scale of the test to match your unique heart rate variability. You need to perform three calibration tests for both tests. These need to be done when you have no accumulated recovery time. Ideally, you also feel fully recovered and are not ill or stressed during these calibration tests. During the calibration period, you may get results that are higher or lower than expected. These results are indicated in the watch as your estimated recovery status until the calibration is completed. Once you have completed the calibration, the latest result is displayed when you enter the logbook instead of recovery time. The quick recovery test, powered by Firstbeat, is an alternative way to measure your recovery status. The sleep recovery test is a more accurate method to measure your recovery status. But for some individuals, wearing a heart rate sensor throughout the night may not be feasible. The quick recovery test only takes a few minutes. For best results, you should lie down, stay relaxed, and not move around during the test. We recommend performing the test in the morning after waking up. This helps ensure you get comparable results day to day. You need to perform three tests while you are feeling well recovered and have no accumulated recovery time to calibrate the test algorithm. The calibration tests do not need to be done in sequence, but they need to be at least 12 hours apart. During this calibration period, you may get results that are higher or lower than expected. These results are indicated in the watch as your estimated recovery status until the calibration is completed. Press Start Stop, scroll to RECOVERY with Start Stop, and select with Next. Scroll to Quick test and select with Next. When the test is complete, scroll through the results with Next and Back Lap. The results of this test do not impact your accumulated recovery time. The sleep recovery test, powered by Firstbeat, provides a reliable indicator of you recovery status after a night's sleep. The calibration tests do not need to be done in sequence. Scroll to Sleep test and select with Next. If you want to cancel the test, press Back Lap. When you are ready to get up in the morning, end the test by pressing Start Stop or Next. When the test is ended, scroll through the results with Next and Back Lap. The sleep recovery test requires at least two hours of good heart rate data to produce results. The results of this test do not impact your accumulated recovery time.